Though some of the acting and dialogue leave something to be desired, You’re Next coasts by on well-sustained tension and a strong lead performance by Sharni Vinson. After strong box office showings by two other horror thrillers this summer (The Purge and especially The Conjuring), it seems that moviegoers were pretty much horrored-out, resulting in low returns for this Adam Wingard-directed fright flick. On top of it, The Purge involved masked home invaders, the same basic idea behind You’re Next. The film’s central twist is okay (I saw it coming in advance of the big reveal, and believe me when I say I never see twists coming), but the overall feel of the movie fairly screams direct-to-video. I’m shocked that Lionsgate had the confidence to give this a wide summer release. It’s been sitting around since its 2011 festival premiere. They might’ve cleaned up in October, but there wasn’t room for it in August. Paul (Rob Moran) and Aubrey Davison (Barbara Crampton) are celebrating their 35th wedding anniversary. They live in a mansion out in the middle of nowhere. Unbeknownst to them, their only neighbors have been brutally butchered by mysterious invaders wearing animal masks. Apparently a very busy couple, they cranked out a whole brood of offspring – all of whom show up with significant others in tow for a big dinner. Their insecure son Crispian (A.J. Bowen, with heavy beard and graying hair he looks at least as old as his father) has a perky Aussie girlfriend, Erin (Vinson), who some of the other siblings find off-putting. Arguments quickly ensue amongst the family, curtailed only when arrows begin crashing through windows, some striking various family members. Before long, the Davison family is fully under siege. It becomes apparent that there’s more than one villain. Someone is already inside the house. As the tension mounts, becoming strong without ever truly reaching edge-of-your-seat terror, we come to understand what’s really going on. 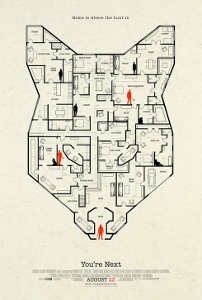 Revealing more would require a spoiler alert, so consider yourself warned because the rest of this review proceeds under the assumption that you’ve already seen You’re Next. As it turns out, two of the brothers – Crispian and Felix (Nicholas Tucci) – were behind the whole attack. They planned to split a sizeable inheritance following what they expect will be the unsolved murder of their entire family. Not a bad idea, but it would’ve worked better had we known more about why these two brothers so intensely hated their own family that they would go this far. Before the attack on the Davison house begins, we glimpse the unrest within the family but it’s hard to make the leap to these two guys being complete sociopathic maniacs. It’s cool to see Erin, who grew up on a survivalist compound in the Australian Outback, spring into action – turning the tables on the ex-military killers the Davison brothers have hired. But a more incisive and reveal first act could’ve strengthened director Adam Wingard’s portrayal of the ultimate dysfunctional family.